Calling All Faculty, Staff, Teachers, and Educational Organizations – This Event is for You! This interactive session will develop engineering faculty, staff and professionals to use research-based methods and standards to design, build, and implement engineering activities that are relevant to P12 classrooms and outreach environments. This interactive session will train engineering faculty, staff and professionals to use research-based methods and standards to develop and implement engineering activities that are relevant to P12 classrooms and outreach environments. 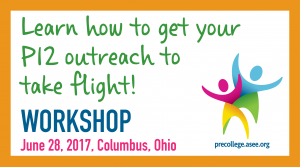 In this workshop, participants will first explore standards and research based best practices for engineering outreach. Participants will then be immersed in a hands-on engineering design activity to understand how the best practices look in action. The workshop will conclude with work time for participants to plan engineering P12 outreach activities related to their engineering discipline and location and brainstorm ideas with other attendees to identify ways to apply their new engineering education learnings. Brainstorm ideas with other attendees to identify ways to apply their new engineering education learnings.